Robert Delaunay was a French artist who, with his wife Sonia Delaunay and others, co-founded the Orphism art movement, noted for its use of strong colours and geometric shapes. His later works were more abstract. His key influence related to bold use of colour and a clear love of experimentation with both depth and tone. Montparnasse (French ) is an area of Paris, France, on the left bank of the river Seine, centred at the crossroads of the Boulevard du Montparnasse and the Rue de Rennes, between the Rue de Rennes and boulevard Raspail. Montparnasse has been part of Paris since 1669. Eugène Henri Paul Gauguin was a French post-Impressionist artist. Unappreciated until after his death, Gauguin is now recognized for his experimental use of color and Synthetist style that were distinctly different from Impressionism. Toward the end of his life, he spent ten years in French Polynesia, and most of his paintings from this time depict people or landscapes from that region. Charles Delaunay was a French author, jazz expert, co-founder and long-term leader of the Hot Club de France. In 1911, Sonia Delaunay made a patchwork quilt for Charles's crib, which is now in the collection of the Musée National d'Art Moderne in Paris. This quilt was created spontaneously and uses geometry and colour. Contemporary art critics recognize this as the point where she moved away from perspective and naturalism in her art. Around the same time, cubist works were being shown in Paris and Robert had been studying the colour theories of Michel Eugène Chevreul; they called their experiments with colour in art and design simultanéisme. 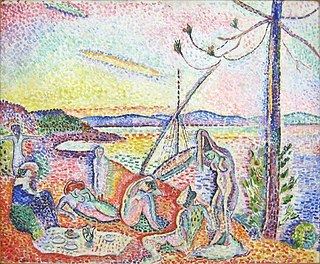 Simultaneous design occurs when one design, when placed next to another, affects both; this is similar to the theory of colours (Pointillism, as used by e.g. Georges Seurat) in which primary colour dots placed next to each other are "mixed" by the eye and affect each other. Sonia's first large-scale painting in this style was Bal Bullier (1912–13), a painting known for both its use of colour and movement. The Delaunays' friend, the poet and art critic Guillaume Apollinaire, coined the term Orphism to describe the Delaunays' version of Cubism in 1913. It was through Apollinaire that in 1912 Sonia met the poet Blaise Cendrars who was to become her friend and collaborator. Sonia Delaunay described in an interview that the discovery of Cendrars' work “gave me [her] a push, a shock.”  She illustrated Cendrars' poem La prose du Transsibérien et de la Petite Jehanne de France (Prose of the Trans-Siberian and of Little Jehanne of France) about a journey on the Trans-Siberian Railway, by creating a 2m-long accordion-pleated book. Using simultaneous design principles the book merged text and design. The book, which was sold almost entirely by subscription, created a stir amongst Paris critics. The simultaneous book was later shown at the Autumn Salon in Berlin in 1913, along with paintings and other applied artworks such as dresses, and it is said[ who? ] that Paul Klee was so impressed with her use of squares in her binding of Cendrars' poem that they became an enduring feature in his own work. The Delaunays travelled to Spain in 1914, staying with friends in Madrid. At the outbreak of the First World War in 1914 Sonia and Robert were staying in Fontarabie, with their son still in Madrid. They decided not to return to France. In August 1915 they moved to Portugal where they shared a home with Samuel Halpert and Eduardo Viana. With Viana and their friends Amadeo de Souza-Cardoso, whom the Delaunays had already met in Paris,  and José de Almada Negreiros they discussed an artistic partnership. In Portugal she painted Marché au Minho (the market at Minho, 1916), which she later says was "inspired by the beauty of the country". Sonia had a solo exhibition in Stockholm (1916). Sonia, Robert and their son Charles returned to Paris permanently in 1921 and moved into Boulevard Malesherbes 19. The Delaunays' most acute financial problems were solved when they sold Henri Rousseau's La Charmeuse de serpents (The Snake Charmer) to Jacques Doucet. Sonia Delaunay made clothes for private clients and friends, and in 1923 created fifty fabric designs using geometrical shapes and bold colours, commissioned by a manufacturer from Lyon. Soon after, she started her own business and simultané became her registered trademark. With Heim she had a pavilion at the 1925 Exposition Internationale des Arts Décoratifs et Industriels Modernes, called boutique simultané. Sonia Delaunay gave a lecture at the Sorbonne  on the influence of painting on fashion. "If there are geometric forms, it is because these simple and manageable elements have appeared suitable for the distribution of colors whose relations constitute the real object of our search, but these geometric forms do not characterize our art. The distribution of colors can be effected as well with complex forms, such as flowers, etc. ... only the handling of these would be a little more delicate." Robert Delaunay died of cancer in October 1941. Her son, Charles Delaunay, became an expert in jazz music during the 1930s. He was a jazz critic, organizer of jazz concerts and a founder of the Hot Club of France (the first jazz club in France) and the first editor of Jazz Hot Magazine, the club's official publication. Delaunay's painting Coccinelle was featured on a stamp jointly released by the French Post Office, La Poste and the United Kingdom's Royal Mail in 2004 to commemorate the centenary of the Entente Cordiale. ↑ Sonia,, Delaunay,. Sonia Delaunay patterns and designs in full color. New York. ISBN 0486259757. OCLC 18907745. ↑ Baron and Damase point out that much about Sonia Delaunay's early life is ambiguous or unknown: "(...) there were parts of her past that she did not easily discuss. (...) the first twenty years of her life (...) can hardly be called a detailed account. Even the actual date of her birth is ambiguous." (page 7). Odessa is mentioned as alternative place of birth, 4 November 1885 as less likely date. ↑ admin (2018-02-21). "Uhde, Willy". Stein, Gertrude. The Autobiography of Alice B. Toklas. New York: Harcourt & Brace, 1933; Uhde, Wilhelm. Von Bismarck bis Picasso: Erinnerungen und Bekenntnisse. Zürich: Verlag Oprecht, 1938; Kultermann, Udo. The History of Art History. New York: Abaris, 1993, p. 133; Kraus, Rosalind. The Picasso Papers. London: Thames and Hudson, 1998, pp. 12, 98-99; Madsen, Axel. Sonia Delaunay: Artist of the Lost Generation. New York: McGraw-Hill, 1989, pp. 74-89; Thiel, H. "Wilhelm Uhde: Ein offener und engagierter Marchand-Amateur in Paris vor dem Ersten Weltkrieg. "in, Junge-Gent, Henrike, ed. Avantgarde und Publikum, Cologne: Böhlau, 1992, pp. 307-20. Retrieved 2019-03-04. ↑ "Masters of Photography: Lothar Wolleh". ↑ Baron/Damase: p. 55. Sonia returned to Paris briefly to make arrangements for their absence. ↑ Baron/Damase: p. 72, Valérie Guillaume: Sonia und Tissus Delaunay. In Kunsthalle: p. 31, Düchting: p. 52, p. 91. According to Morano (p. 19), branches in Bilbao and Barcelona never actually opened. ↑ Baron/Damase: p. 72. Diaghilev met Manuel de Falla at this salon. The two would later cooperate on The Three-Cornered Hat. ↑ Baron/Damase: p. 81, p. 83. Morano: p. 21. Düchting: p. 56, Gronberg: p. 115. Guillaume: p. 33, cites Guévrékian as the architect of the pavilion. ↑ Sonia designed costumes and contributed to styling the set, several of Robert's paintings were part of the set. Baron/Damase: p. 84, Kunsthalle: pp. 33, 216, Düchting: p. 58. ↑ Press release Centre Pompidou: "The exhibition comprises some ninety works by Robert and Sonia Delaunay, chosen from the donation which itself totals one hundred and fourteen paintings, drawings, bound books, reliefs and mosaics." ↑ Baron/Damase: p. 194. Rythmes-Couleurs is an artist's book in a limited edition of 120 copies. ↑ Kunsthalle: p. 221. Robes Poèmes is an artists' book in a limited edition of 500 copies. ↑ Artcurial advertisement "Sonia Delaunay – Le service Sonia au quotidien". Maison Française (386/Avril 1985): 37. Baron, Stanley; Damase, Jacques (1995). Sonia Delaunay: The Life of an Artist. Harry N. Abrams. ISBN 0-8109-3222-9. Baron, Stanley; Damase, Jacques (1995). Sonia Delaunay : the life of an artist. Thames & Hudson. ISBN 0-500-23703-4. Düchting, Hajo (1995). Delaunay. Taschen. ISBN 3-8228-9191-6. Grosenick, Uta (2001). Women Artists in the 20th and 21st Century. Taschen. ISBN 3-8228-5854-4. Robert Delaunay - Sonia Delaunay: Das Centre Pompidou zu Gast in Hamburg. Hamburger Kunsthalle. 1999. ISBN 3-7701-5216-6. Delaunay, Sonia; Morano, Elizabeth; Vreeland, Diana (1986). Sonia Delaunay: art into fashion. G. Braziller. ISBN 0-8076-1112-3. Chadwick, Whitney; True Latimer, Tirza (2003). The Modern Woman Revisited: Paris Between the Wars. Rutgers University Press. ISBN 978-0-8135-3292-9. Delaunay, Sonia; Damase, Jacques (1966). Rythmes-Couleurs. Galerie Motte. OCLC 460063028. Delaunay, Sonia; Damase, Jacques (1978). Nous irons jusqu'au soleil. Robert Laffont. ISBN 978-2-221-00063-2.
d'Orgeval, Domitille (2003-11-07). "L'histoire du Salon des réalités nouvelles de 1946 à 1956" (PDF). Le Journal des Arts. Retrieved 2010-04-19. "Robert et Sonia Delaunay, Donation Sonia et Charles Delaunay" (PDF). Centre Pompidou. 2003-10-01. Archived from the original (PDF) on 2010-02-15. Retrieved 2010-04-19. Seidner, David (1982). "Sonia Delaunay". BOMB Magazine . No. 2/Winter 1982. Retrieved 23 June 2013. The interview took place Spring 1978 in Paris. Slevin, Tom (2010). "Sonia Delaunay's Robe Simultanée: Modernity, Fashion and Transmediality". Fashion Theory. 17 (1): 27–54. 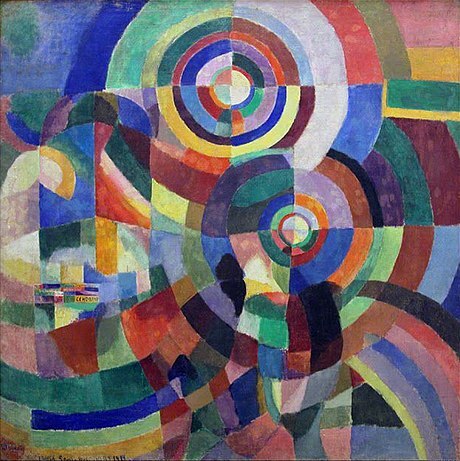 Wikimedia Commons has media related to Sonia Delaunay . De Julio, Maryann (1 Mar 2009). "Sonia Delaunay". Jewish Women's Archive. Art Deco Online video by The New York Public Library which includes Sonia Delaunay's artistic works. arskey: magazine d'arte moderna e contemporanea. "Sonia Delaunay: Carte". teknemedia (in Italian). Retrieved 31 July 2017. Frédéric-Louis Sauser, better known as Blaise Cendrars, was a Swiss-born novelist and poet who became a naturalized French citizen in 1916. He was a writer of considerable influence in the European modernist movement. Marie Laurencin was a French painter and printmaker. She became an important figure in the Parisian avant-garde as a member of the Cubists associated with the Section d'Or. Ricciotto Canudo was an early Italian film theoretician who lived primarily in France. In 1913 he published a bimonthly avant-garde magazine entitled Montjoie!, promoting Cubism in particular. He saw cinema as "plastic art in motion", and gave cinema the label "the Sixth Art", later changed to "the Seventh Art", still current in French and Spanish, among others. Canudo subsequently added dance as a precursor to the sixth—a third rhythmic art with music and poetry—making cinema the seventh art. Wilhelm Uhde was a German art collector, dealer, author and critic, an early collector of modernist painting, and a significant figure in the career of Henri Rousseau. La prose du Transsibérien et de la Petite Jehanne de France is a collaborative artists' book by Blaise Cendrars and Sonia Delaunay-Terk. The book features a poem by Cendrars about a journey through Russia on the Trans-Siberian Express in 1905, during the first Russian Revolution, interlaced with an almost-abstract pochoir print by Delaunay-Terk. The work, published in 1913, is considered a milestone in the evolution of artist's books as well as modernist poetry and abstract art. Gabriel Guevrekian was an Armenian architect, who designed buildings, interiors and gardens, and taught architecture. He worked in Europe, Iran and the USA. The Salon des Réalités Nouvelles is an association of artists and an art exhibition in Paris, focusing on abstract art. Roger Bissière was a French artist. He designed stained glass windows for Metz cathedral and several other churches. Le Vertige is a 1926 French film directed by Marcel l'Herbier. Marie-Jacques Renée "Jacotte" Perrier was a French singer, fashion journalist, voice actress, socialite, author and art collector. She was best known for her musical collaborations with the Quintette du Hot Club de France and her fashion reporting for Fairchild Publications. She was the daughter of musical composer and haute couture textile supplier Robert Perrier, from whom she inherited direction of the R-26 artistic salon. 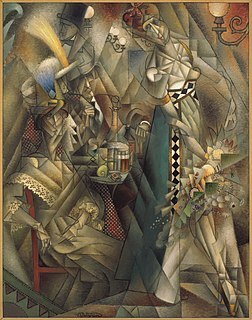 Danseuse au café is a large oil painting created in 1912 by the French artist and theorist Jean Metzinger (1883–1956). The work was exhibited in Paris at the Salon d'Automne of 1912, entitled Danseuse. The Cubist contribution to the 1912 Salon d'Automne created a controversy in the Municipal Council of Paris, leading to a debate in the Chambre des Députés about the use of public funds to provide the venue for such 'barbaric' art. The Cubists were defended by the Socialist deputy, Marcel Sembat. This painting was realized as Albert Gleizes and Jean Metzinger, in preparation for the Salon de la Section d'Or, published a major defence of Cubism, resulting in the first theoretical essay on the new movement, Du «Cubisme». Danseuse au café was first reproduced in a photograph published in an article entitled Au Salon d'Automne "Les Indépendants" in the French newspaper Excelsior, 2 Octobre 1912. The painting is now located at the Albright-Knox Art Gallery, Buffalo New York. L'Oiseau bleu is a large oil painting created in 1912–1913 by the French artist and theorist Jean Metzinger (1883–1956); considered by Guillaume Apollinaire and André Salmon as a founder of Cubism, along with Georges Braque and Pablo Picasso. L'Oiseau bleu, one of Metzinger's most recognizable and frequently referenced works, was first exhibited in Paris at the Salon des Indépendants in the spring of 1913, several months after the publication of the first Cubist manifesto, Du «Cubisme», written by Jean Metzinger and Albert Gleizes (1912). It was subsequently exhibited at the 1913 Erster Deutscher Herbstsalon in Berlin. Apollinaire described L'Oiseau bleu as a 'very brilliant painting' and 'his most important work to date'. L'Oiseau bleu, acquired by the City of Paris in 1937, forms part of the permanent collection at the Musée d'Art Moderne de la Ville de Paris. La danse is an oil painting created circa 1906 by the French artist and theorist Jean Metzinger (1883–1956). Bacchante is a pre-Cubist or Proto-Cubist work executed in a highly personal Divisionist style during the height of the Fauve period. Bacchante was painted in Paris at a time when Metzinger and Robert Delaunay painted portraits of one another, exhibiting together at the Salon d'Automne and the Berthe Weill gallery. Bacchante was exhibited in Paris during the spring of 1907 at the Salon des Indépendants, along with Coucher de soleil and four other works by Metzinger. Jeanne-Henriette Tirman was a French woman painter and printmaker. The Eiffel Tower series of Robert Delaunay is a cycle of paintings and drawings of the Eiffel Tower. Its main sequence was created between 1909 and 1912, with additional works added up to 1928. The series is considered the most prominent art depicting the iconic Paris tower as well as the most prominent work of Delaunay.